Thousands of people flooded downtown Evansville for the first day of sunshine at Shrinersfest! The LST 325 got the attention of both young and old as it was on full display as part of a World War II re-enactment. 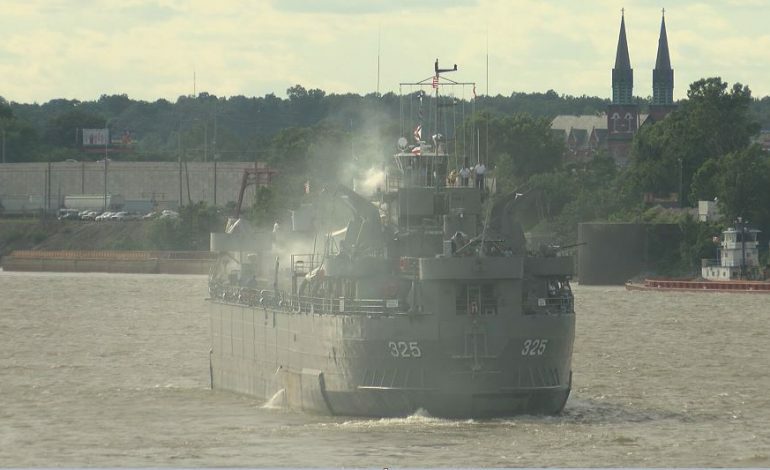 Shrinersfest offering a lesson in history with a re-enactment of the invasion of Normandy. “There’s a lot of attention toward re-enactments simply because you can see and experience something that happened many, many years ago and that often times, relatives that people have spoken with in person or have heard stories can see it unfold in front of them,” said actor James Combs II. The re-enactment ended at Four Freedoms Monument where the public could get pictures and kids could interact with the soldiers, “I don’t know if they understand but they sure are interested. We get a lot of questions and we try to interact with the younger kids, it’s great to get the interest from that young set of children,” said actor Robert Decker.